With this new logo, viewers can identify our company throughout a crowd of skateboards and also can identify us on social media and other mediums. Nicest Skateboards has been around for 2 years, but did not have a logo during that time. Having a logo is essential for branding, identity, and the lifeline of the company. To have a logo that integrates what they are all about is crucial. I worked with the owner to make a logo that would tell people exactly what we were about at one glance. I designed a logo using the first letter of Nicest, “N” and converted the arm of the “N” into a skateboard. At an instance, people can understand that this is a skateboard company. The owner of Nicest had done a little bit of research into logos and took the liberty of drawing something simple for the logo. In essence, a slanted “N” with wheels on the right side of it. This was a good start because I had a similar idea, but decided to make 2 versions to show. One that was like the drawing and one that was more modern and eye catching. Using rounded ovals and the Shape Builder tool, I made a custom N that was similar to what the owner drew. I made the right arm of the N curve so that it would look very much like the deck of a complete skateboard. I intentionally made the left arm smaller than the right in order to emphasize the skateboard. For the 2nd design, I decided to go with Clear Sans Medium as the font to modify because of its geometric and asymmetrical shape. 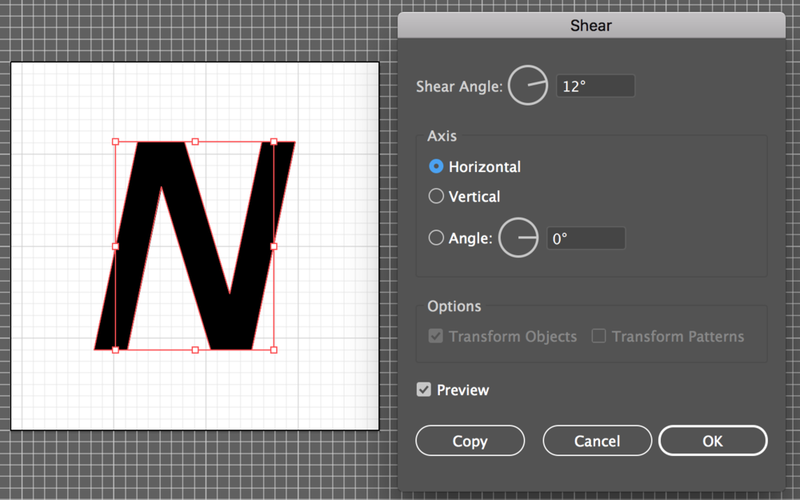 After turning the “N” into a custom oblique, I took the angle of the right arm of the “N” and made a line in order to use the pathfinder tool to separate the arm. I did this in order to separate this piece and prepare to make it into the skateboard. Since this sans serif did not have an italic, I decided to make it an oblique by shearing it 12 degrees clockwise. After separating the right arm from the body of the “N,” I moved the arm over a bit from the body and took a look at it. Even though this sans serif is symmetrical, once I took out the arm and moved it, it felt off balanced. As a result, I needed to trim a bit off of the body using the same angle line from the arm. Finally added circles as wheels and we’re ready to ride.